Which means that for a longer expression I might have to enter several freeform-input in a single line, which doesn't make it more readable. I've been playing with it for an hour. It hung several times and crashed once (Not reproducible) and I had to restart it once. This may be a bit philosophical: I'm using a programming language because I want to express an idea unambiguously. I don't want it to guess whether the symbol t means a variable for time or metric tons. The freeform-boxes look weird in a presentation or publication. Of course, I can convert them to input or display form easily, but (in the right context) an expression like 1920*1080 Bytes*24/s might mean something to the reader, but 2.0739999999999998*^6B*(24/1s) doesn't, even if it's the same value. but I'm not sure if the Power/Times replacement really covers all cases. Maybe someone can find counterexamples or improve it. Using that, I get the simple input I had with the old Units package (including command completion) and things like 0 second + 1 hour still work. You can set $Pre = withUnits, if you want to save some typing. The above function is a hack, of course, but it does dynamic code generation, uses Block trick and local UpValues, so I decided to post it still. As noted in the documentation for Quantity, you can use ctrl-= to input units. 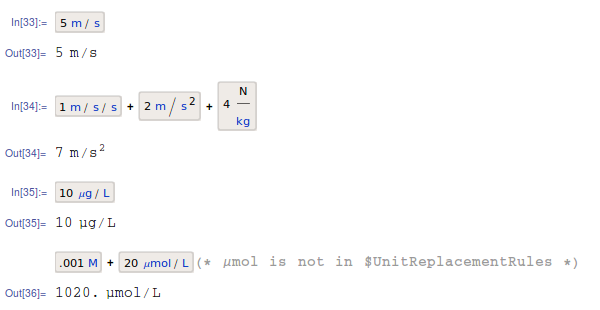 This uses Wolfram|Alpha, so needs an internet connection. The same comments as in Rojo's answer apply. This is currently set up to add the alias to only the InputNotebook, it could be made to add the alias to $FrontEnd which would make it work in all notebooks (until it is removed). Note that $UnitReplacementRules would have to be added to the init.m or something similar if you want this code to work across sessions. Sorry for the lack of whitespace. I made this using TraditionalForm. I fully agree that the current Units syntax is cumbersome. I thus found this thread, which I came upon recently, of great interest. The various code blocks in the previous answers each offered unique functionality at the time they were written. Alas, they are currently all either non-canonical, or cause the current version of MMA to crash. An additional limitation is that these only work for the particular units or physical constants you've pre-defined. [I should add that both of these limitations were effectively noted by the author of withUnits, Leonid Shiffrin, who pointed out that his code was offered as a prototype that "will only be as good as you make it to be".] Thus I would say the best application of these two code blocks would be for "production work" (entering many formulas using a known set of units, in a known way), where their speed and simplicity of use would offer great convenience, and you'd be controlling for potential non-canonical behavior by using them under well-tested circumstances. My typical use case is, however, different — I most commonly do one-offs, in which I may need to use a unit or physical constant I've never used before, or in a way I've never before used it. Ctrl= is more suitable for that application, and doesn't fail for the above example, but I find it a bit tedious for long formulas. For instance, even with the above simple formula, to enter "min" I have to hit Ctrl=, then type "minutes", then hit the right arrow to get out of the box, then wait for the Wolfram server to respond; only after all this can I enter the comma. This then has to be repeated to enter "s". Having said that, Ctrl= is very handy for unit discovery. Finally, all three versions of the code blocks that create unit-entry-panels cause my version of MMA (11.3 running on MacOS 10.13.2) to crash as soon as I type esc q. Not the answer you're looking for? Browse other questions tagged units or ask your own question. Should 0 * 5ft be 0 or 0ft? Can you make the new “Choose color scheme” helper larger? Powers of dimensionless quantities: is this a bug? How to create fast functions based on units?